Diasporic communities can now take virtually full part in national political and civic life in their countries of origin, thanks to new media. From the academic and activist perspectives, what are the consequences? We have on the panel members of the diaspora as well as people who still live in their countries of origin, where they feel the impact of diasporic communications. Fred Petrossian (@fredpetrossian | bio) is an editor at Global Voices and from Iran, as well as a professional journalist based in Prague working with Radio Free Europe. He sees many Iranians forced into political exile by waves of political repression and mass executions. Not all Iranians left for political reasons, but a significant percentage of the diaspora is outside of the country because of political beliefs. Fred has seen examples of how a diaspora can successfully help those still in the country, but also how it can hinder local movements. The internet in Iran is very slow, by government design. The diaspora plays a very important role in amplifying the message. Demonstrations after abductions or executions, or to save a dying lake, pass through the diaspora, where the word travels quickly on social networks. This is very helpful, and in some cases even a matter of life and death. But sometimes the diaspora is trapped in its own bubble, and their knowledge of what is occurring is influenced by the media they are consuming in their new country. They sometimes have to rely on television and radio to understand what’s taking place in Iran. When they look at Facebook, they see an overwhelming revolution bringing about the regime’s last day. But the security forces have access to social networks, too. Diasporas can talk online and spread messages quickly, but the heart and the soul of the country must be involved or nothing will happen. Fred sees a slacktivist aspect of diasporic involvement online, creating a disconnection and a gap with those still living in Iran. But diaspora do play a critical role in putting international attention on cases of political persecution, thus protecting activists. Nanjira Sambuli (@NiNanjira | bio) introduces us to the Kenyan diaspora’s “Call Washington” mentality. Local consulates have information about the home country for those living in the diaspora, but this information is only periodically updated, and technology moves quickly. The Kenyan diaspora online is segmented based on where they are. The online communities often started as email listservs, and grew from there. Following the election and subsequent violence, though, divides between tribes had a severe impact on the online diaspora, and killed discussion in many fora. 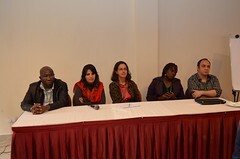 The diaspora has blogs, but rarely have people in Kenya been involved with them, and vice versa. Last week saw a “love protest” in Nairobi by Boniface Mwangi, bringing people out into the streets to unify and call for an end to the nation’s culture of impunity. For the first time in 45 years, the diaspora was able to see the events unfold in real-time on Facebook and elsewhere online without calling Washington for information. They actually participated, in at least a minimal way. There’s sometimes alienation between those who left and moved upwards economically, and those still here. It’s important that the diaspora bring money home to invest, and continue talking to people here so their information is accurate. The “Call Washington” mentality, at least, is fading away. Elaine Diaz (@elainediaz2003 | bio | blog) speaks to us in Spanish, with Susan translating. As a professor at the University of Havana, and as a blogger, she has a unique perspective on the role of the diaspora online. In order to understand the relationship between Cuba and its diaspora online, you must understand the same relationship offline. It’s a very difficult relationship. Large numbers of Cubans migrated to the US following Fidel Castro’s rise to power, particularly Miami. Only 14% of the Cuban population has access to the internet, so it can seem that even talking about the relationship between Cuba and its diaspora online is a dream. Of that 14%, most are only using email. So it might seem like a dream to talk about a relationship between Cuba and its diaspora online. But that’s not the case. There are many Cubans using new technologies to communicate, inside and outside Cuba. Social media such as Facebook, Twitter, and open source blogging on WordPress are popular means of communication and ways to talk about the harsh realities of the Cuban experience. The online space for Cubans is a battlefield between the diaspora and those still living in Cuba. The #cuba hashtag is an open political battle between government sympathizers and opposition. A younger generation of Cubans online are looking for new spaces to communicate with one another. There are some common points of agreement, particularly around immigration reform within the Cuban government. In spite of political differences, everyone agrees it’s necessary to eliminate the exit permit the Cuban government currently requires, among other migration-related issues. Another interesting point of agreement is around access to the internet and the sorry state of internet penetration in the country. Cuban civil society is demanding access to the internet not only for commercial services like email, but also for public participation in society. They seek the ability to debate, but also a role in decisionmaking. As a scholar of the Cuban blogosphere, Elaine finds this consensus meaningful. Although we don’t live in Cuba, we can assist. We can watch it unfold online. Gershom Ndhlovu (@GNdhlovu | bio) is a Zambian living in the United Kingdom, with firsthand experience of life in the diaspora. In the last 20 years, Zambia has changed presidents four times. The Zambian diaspora understands what’s going on at home. Those Zambians working in the media understand local events up to the very minute. Many are fighting for dual citizenship. Most of the Zambians who have migrated in the last 20-30 years have gained dual citizenship in their new countries of residence. Unlike the other panelists thus far, Zambians migrate primarily for economic, rather than political, reasons. Markos: If online communications facilitates contact between exiles and the home country, does it make it easier for journalists and others to leave the country in the first place? And how would you define good journalism conducted from exile? What advantages and disadvantages does being outside of the country pose? Fred responds that he monitors local Zambian news websites, and runs an online news station where they interview Zambians still in the country. They’ve reached the point where Zambian newspapers actually monitor their show for news, indicating a level of trust despite their physical location outside of the country. They have built credibility. Kenyans on Twitter (#kot) are trying to change the rest of the world’s perception of Africa, and of Kenya in particular. What happens when a particular person in the diaspora becomes a voice representing the home community? When the international media seek them out to speak for others? In effect, how does the diaspora community deal with representation? Elaine says it would be extremely difficult for Cubans living on the island to accept a representative voice in the diaspora as legitimate, because they are the ones living their lives in Cuba. When she found herself at a conference in Rio de Janeiro for a couple of weeks, she found herself having nothing to write about Cuba on her blog. She argues that being physically present in a place is mandatory to forming an authentic opinion about events there. You can really only know what's going on in Cuba when you're there, when you get a feel for what's really going on on the ground. Susan points to Yoani Sanchez’s Generation Y as another example of a blogger who no longer claims to represent Cuba, having left the country. Nanjira says that Kenyans in the diaspora have a duty to communicate about the country to the rest of the world. The real story gets oversimplified. For example, there are several advisories against traveling in Kenya right now due to recent grenade attacks, and that’s what gets international press. But there’s also the Global Voices Summit taking place this week. Journalists and others in the diaspora need to tell that story to the world, and counter mainstream media organizations like CNN, whose coverage is sometimes completely inaccurate, or at best incomplete. Nanjira warns that anyone in the diaspora who takes a preachy, condescending approach when talking about the home country is not very highly regarded at home. People in the diaspora write op-eds for foreign newspapers, but these individuals rarely engage online. Kenyans still in the country try to get in touch with them, but they never hear back. There’s little conversation that continues, such as in the comments sections on online newspaper op/eds. Overall, new media is having a huge effect: the diaspora goes to new sources for breaking news and information (e.g. the Red Cross for on-the-ground news from grenade attacks) on the same online platforms on which they are engaging. Nanjiru responds to comment from a Kenyan (who’s lived in the country and in the diaspora) about generalizing others’ experiences: How do you bridge the gaps in the current engagement between those here and abroad? It starts with the dialogue, and social media can help. She says Kenyans are very divided as a people, both here and abroad. We need to have a “think tank”, to have that dialogue as a people and unify.